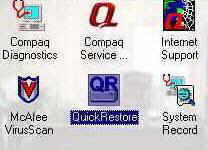 On the desktop and on the Start Menu is a program called Compaq Support. Run this and the screen below will be displayed. From the next menu select Full System Restore.